For many years I lived in neighborhoods where the only place to park your car was on the street and you were lucky if you found parking anywhere on your block. When we first bought our house, I remember thinking how great it was to now have a nice, long driveway and ample street parking for guests. What could be better? I thought. But after a few years of suburban living, the fact that our driveway was only wide enough for one car began to annoy us. Mark more than me, but we both agreed it wasn’t ideal. I realize that alot of folks are probably thinking, “wow these are real first-world problems!” and they are, but they are our problems all the same. Because Mark leaves before me in the morning but also gets home before me in the evening, we both can’t park on the driveway during the week. And on the weekend, we often need his truck for a home improvement errand when my car is parked in front of his, or find ourselves headed into town (where his massive truck is a problem in parking structures) at the times when his car is in front. The struggle is real. The other issue is the way it looks. When the house was first built, they only installed 2 long strips of concrete-ish, not a whole driveway and then someone a long time ago added additional concrete around the strips so it looked like this. I apologize for not taking a better close up. We didn’t know what day the folks were showing up to do the work and they did so as I was rushing out the door to catch a train and I completely forgot to snap one, but hopefully the visual of the grass coming up through the middle of the driveway tells you everything you need to know about its condition. Not only does it look worn out and hodgepodge and totally takes away from all the other hard work we have done to increase the curb appeal of the house, all the cracks and lack of smooth surface make it a pain to shovel in the winter. What I like most about this project is that I wasn’t required to do a thing! I left one morning as they crew was getting there to start the work, went to New York over night for my own job, and when I got home the following evening, the whole thing was done. It was still wet, but they were done! On first day, they were able to jackhammer up the existing drive way and porch step and create the mold for the new one. The second day they poured the new concrete, blocked if off, and said wait a week to drive on it. The one casualty of this project was the fence on this side of the yard and bit of the brick sidewalk. Mark has never liked having the fence line so close to the front of the house, so this is an opportunity to change that and he re-built the sidewalk so that it comes up and meets the end of the driveway. In addition to figuring out where to re-install the fence, we are also looking at getting a new garage door to further spruce up the curb appeal of the house. There are so many styles to choose from these days. I will have a whole post about that process in the weeks to come! Okay you guys, file this project under “Seriously, what took you so long?” Back in the spring when we did our front yard makeover, I wanted to finish the project by upgrading our mailbox. 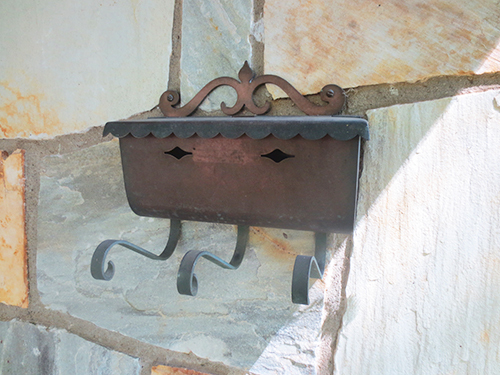 Our mailbox is affixed to the front of our house near the front door. I think it’s charming that our postal worker delivers our mail on foot. I’m sure that’s one of the reasons they’re broke, but I like it. 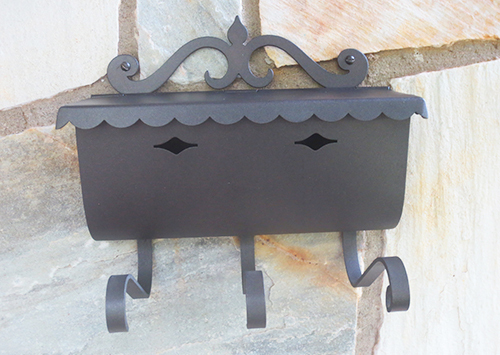 Here’s what our mailbox looked like pre-face lift. Like most things in our house, it’s a little worn, but still in good shape. After a quick search of the Internet, I determined that there wasn’t anything out there that I liked better that didn’t cost an arm and a leg so I set my sights on a rehab assignment. Again, this was back in April. Months went by and for one reason or another I could never find the time to do it. Then this weekend, I just decided to go for it even though we had company visiting and a full social schedule on the agenda. 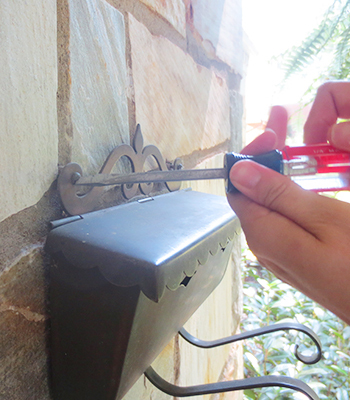 I removed the mailbox from the stone using a flat head screwdriver. Once I had it off the wall, I took it inside and wiped it down with vinegar to get off any dust and cobwebs. 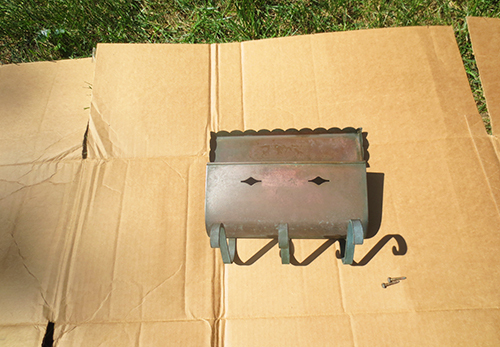 Once I had it cleaned off, I took it out into the yard and placed it on top of a large cardboard piece that I keep for these type of projects. *Side Note: I hate shopping and order alot of stuff online. I get dog food and other household supplies from wag.com and their sister site soap.com. If you’re like me and hate the store, check them out. The extra bonus is you’ll get a big cardboard box like this. 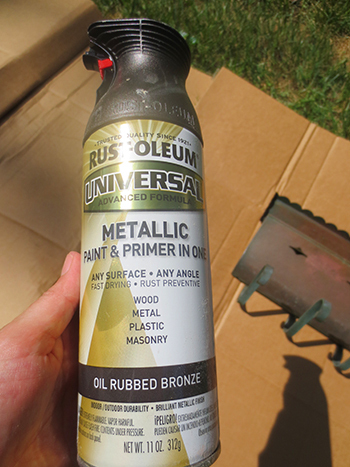 Then I got out my can of oil rubbed bronze spray paint and got to spraying. 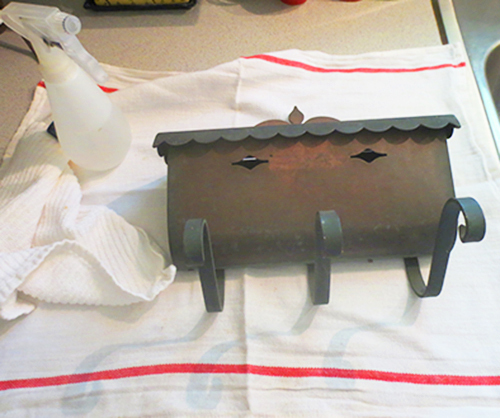 Once I got the front side sprayed, I brought it into the sun room and let it dry overnight. Since it was a holiday weekend, I was able to start on a Sunday and finish on Monday without confusing our mailman. Here’s the backside which was in even worse shape than the front. 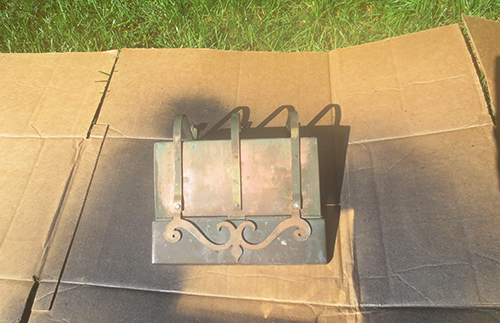 The good news is that the metal took the spray paint really well and it only took about 3 light-medium coats of paint to cover all the old rust and stains. Once the back side was dry, I put it back on the wall and admired my handiwork. Again, here’s where we started. Much better, yes? I can’t believe how easy it was. The whole project took less than an hour outside of drying time. I am so glad that I finally went ahead and took the plunge. I have a couple of fall decorating plans for the porch that I plan to tackle at the end of the month and I am glad that I kicked off the season with this project. 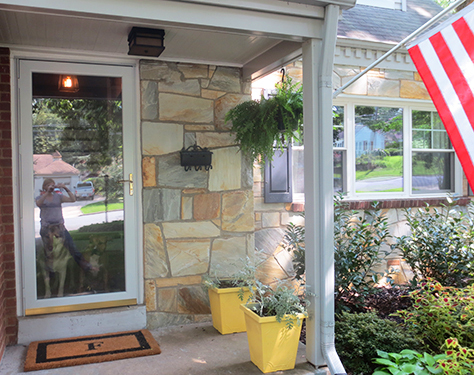 Here’s what the front porch looks like now. It looks pretty good in this photo, but let me keep it real for you. The flowers in the yellow planters lasted about 2 weeks and never bloomed again, so the planters didn’t have as much color as I had hoped for. I’ll be trying something new next year. The fern is on it’s last legs as we haven’t had a much luck keeping these guys as lush and full the past two summers as we did the first. But I still think it’s the best option for our sunless porch. I’ll be looking into some fertilizer or something I can mix in next year. And the porch light still doesn’t work. So there’s that. In the good news column, everything we planted in the spring is still doing well. I think the cool (for us) summer helped. I will be back later this week with a more detailed update on how our front yard makeover is doing 5 months later. Did everyone have a nice, long weekend? We did, but I’m exhausted!